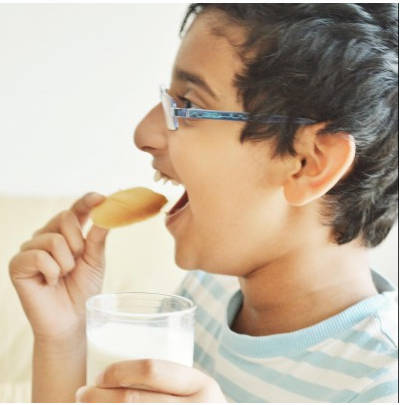 Hello all, I take great pleasure to be on Sonal’s blog doing a guest post for her and being a part of the International Food Festival she is conducting. When I saw Sonal’s mail, asking me whether I could do a guest post for her, I didn’t have to think twice to say yes. The only problem I had was that since i am quite new to the blogging world, i didn’t have much of an idea about guest post. But she was kind enough to explain to me in detail and here i am doing my first guest post. I discovered Sonal’s blog recently and i loved it. I enjoy discovering many new things to try from her amazing vegetarian recipes collection. She writes recipes in such detail, that there is no room for doubt for a reader. Her recipes are crisp and clear! 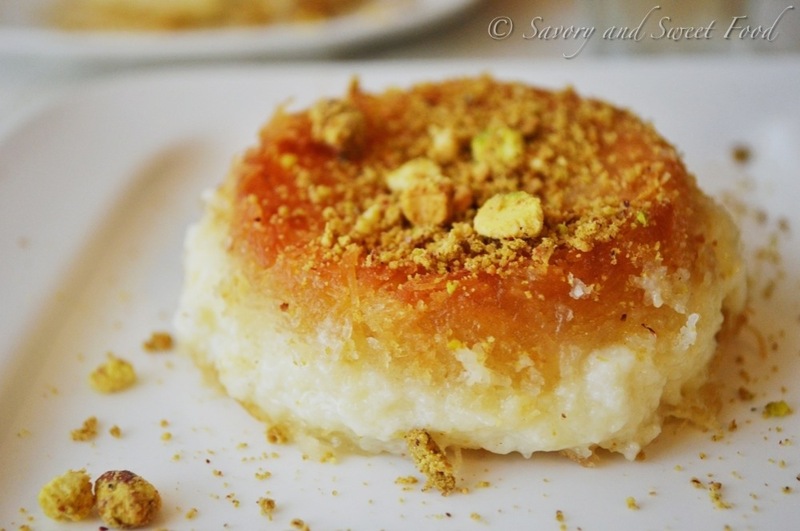 When she requested a Mediterranean dessert for this guest post, I knew for sure what i am going to contribute; the recipe of one of my favorite dessert Kanafeh Naame. Kanafeh (You might also find it spelled knafe, kunafeh, knafah, konafah, konafeh), is a cheese pastry soaked in sweet sugar-based syrup. It consists of two layers of the shredded phyllo with a cheesy cream filling. It is traditionally served warm with a drizzle of simple syrup. 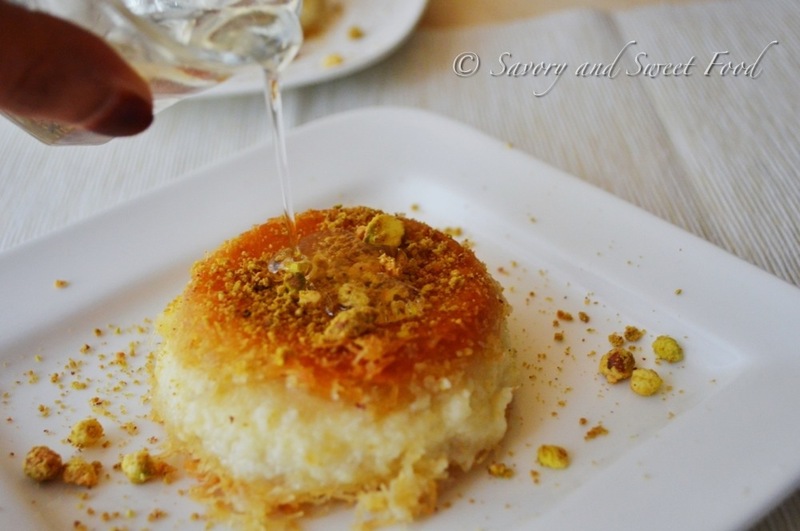 Kanafeh is a speciality especially in Lebanon, Turkey, the Palestinian territories, Syria and northern Egypt. 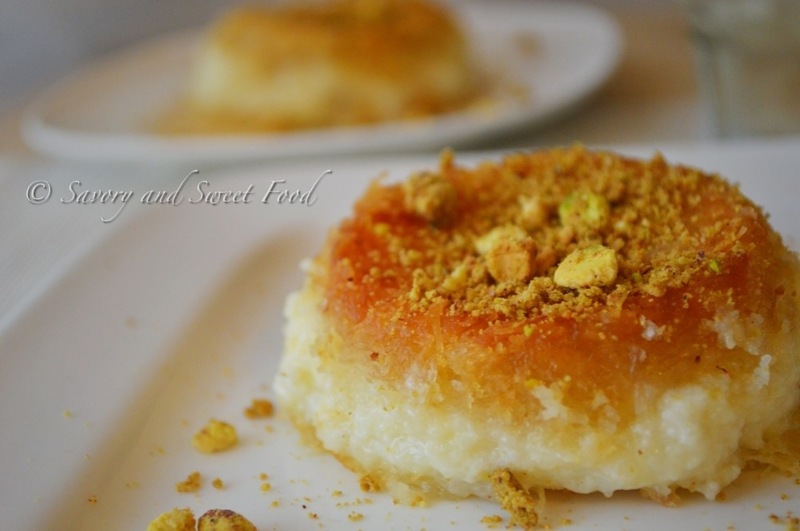 I am in love with this Lebanese dessert “Kanafeh Naame ”. Naame means fine. Here the phyllo dough is shredded really fine, thats why the name. 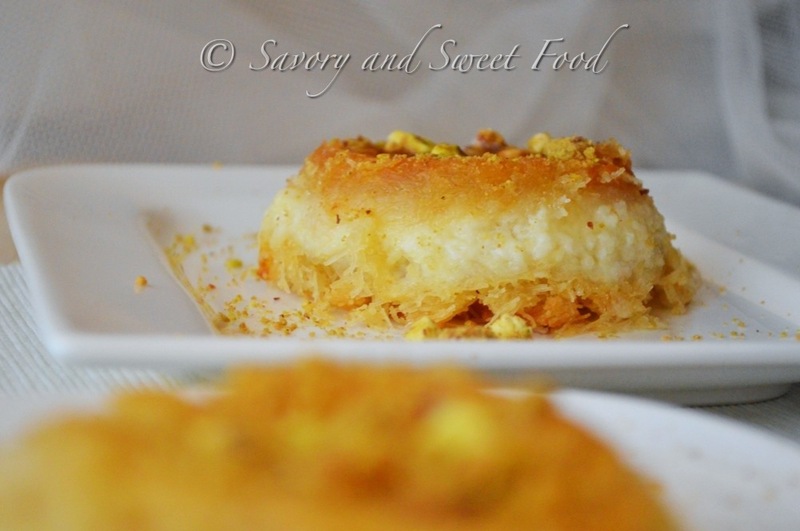 Kanafeh is the middle eastern cheesecake. It is eaten in Lebanon for breakfast as well as a dessert. Like all pastries, it does not contain eggs, it has a mozzarella cheese and semolina filling. Similar to most mediterranian dessert, this one is also not very sweet by itself. It is sweetened by pouring sugar syrup on it after it comes out from the oven, piping hot. Hop over to Sonal’s place to see the step by step pics and the recipe. Also, dont forget to check out her wonderful recipes. Soak the mozzarella in a bowl of water for about 5-6 hours, changing the water every half an hour. In a food processor, add the phyllo dough and process until very fine into small grain size pieces or cut into small pieces with scissors. Add this into a bowl. Add bread crumbs, butter and syrup and combine well. Press half of the dough into the bottom of a 10 inch buttered pan and press down very well. Remove cheese from bowl and tap dry with a paper towel. Put mozzarella in food processor and blend until the cheese if very fine, or just roughly break it into small pieces with hand. Add this into a bowl. In a small pot heat milk and then add semolina, cook for about 2 minutes while stirring. Pour the hot milk over the cheese and combine well. Pour cheese mixture over dough and add the rest of the dough on top. Place in the oven, cook for about 40 minutes or until crust is golden brown. Remove from oven and let cool for 10 minutes before flipping it over onto a nice plate. Decorate with ground pistachio and serve warm with simple syrup. Combine sugar, water and lemon juice in a pot and let simmer over medium heat for 10 minutes then add the rose water and orange blossom water and simmer for another 2-3 minutes. Remove from heat and let cool completely before serving. Store in a tight jar in the refrigerator for up to 2 months. ✔ I made this in small individual ramekins. ✔ This dessert is best served warm. Oh really? Congrats on ur first guest post too. 🙂 saw it. It was great. I guess u hav travelled around the globe. Niice! 🙂 i love lebanese food too. Its delicious. Especially the desserts.